Part of the spectacle of the National Cherry Blossom Festival includes the thousands of visitors that flock to Washington, DC to see the famous cherry trees along the Tidal Basin. 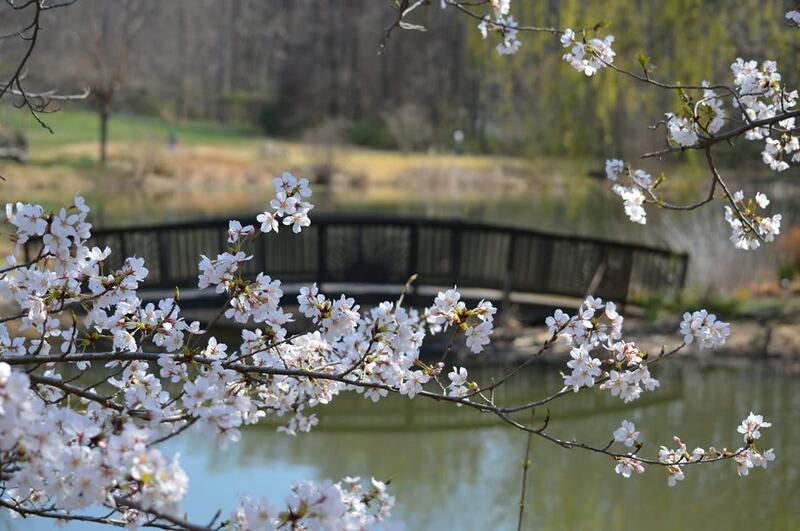 It&apos;s definitely a must-see if you don&apos;t mind the hustle and bustle, but if you&apos;re looking for a more tranquil and off-the-beaten-path way to celebrate what the National Cherry Blossom Festival signifies, check out some of Fairfax County&apos;s hidden and acclaimed gardens. Plan a visit and let us show you how we appreciate seasonal beauty and international friendship. Also, keep tabs with official events and peak bloom updates by visiting our cherry blossom page. A historic 25-acre site on the banks of the Potomac River, River Farm was once part of George Washington&apos;s original five farms and is currently the headquarters of the American Horticultural Society. Japanese Gardens are known for the use of many different elements to create a serene place of nature and reflection. Our gardens, like River Farm, radiate with local history and have hints of Japanese garden elements (water, garden bridges, garden gates, trees, flowers, and fish). With this, we create our own unique spaces like nowhere else. White House Gates – A set of historic White House Gates have found a home at River Farm. André Bluemel Meadow – Native wildflowers. A walnut tree as old as George Washington. Red foxes. Bluebirds. Marsh hawks. Ospreys. Bald eagles. Butterflies. Wildlife Garden – Frogs. Goldfish. Turtles. Berry shrubs. Children&apos;s Garden – More than a dozen small, themed gardens designed to stimulate children’s interest in plants and nature. The Garden Calm – Serene thinking space. Perennials. 200-year-old Osage orange tree. What can we say–we’ve got history. Fairfax County, Virginia has more historic buildings than you can count and Green Spring Gardens is no exception. GSG is a must-visit park, a year-round gold mine of information and inspiration for the home gardener. It&apos;s an outdoor classroom, a museum, and a national historic site. You will never see a more involved community than here - our people love what they do. Above all else, we appreciate what the past has left behind for our future. The culture and heritage left behind at Green Spring Gardens continue to shape the site&apos;s wealth of daily interpretive programs and activities. Highlights: Classes and Camps, Farmers Markets, Garden Tours, Historic Programs, Art Exhibits, Gardening Resources and Blogs, Garden Plots, Horticulture Library, Trails and so much more. You have to see it to experience it – in all its Fairfaxian glory. Don’t miss this one! Tucked away on a remote road in Vienna, right outside of one of the busiest city centers in Fairfax County, you’ll find Meadowlark Botanical Gardens – truly a breathtaking treasure. Each season you’ll discover something new; commitment to plant diversity at Meadowlark is one of its greatest strengths. Side note: The gardens are so stunning, in fact, that I took my high school senior pictures here – seriously, ask my mom, she still keeps the (8-year-old!) pictures hung in her office…it has to be because she loves the backdrop. Highlights: Paths and walkways for easy strolling and relaxing. A center for environmental and horticultural education. Botanical gardens with large ornamental and native plant collections. Exceptional open space provided by Virginia&apos;s rolling Piedmont region. Three lakes provide serene views. Neatly-tended forest gardens. The iconic Korean Bell Garden. TULIPS (my favorite) and wildflowers. Great Blue Herons and waterlilies. Koi fish and turtles. Meadowlark is a bold, yet intimate space. It’s a Garden for education, conservation aesthetics, and community. Most importantly for some of us, it’s quiet and insulated from urbanity. This is a great destination for visitors of all types and can only be appreciated fully when one steps into its embrace. So stretch your legs, get some sunshine and enjoy the beauty of the Piedmont Hills. Looking for more ways to celebrate the National Cherry Blossom Festival in Fairfax County? Check out some of the special events happening through April 14 and keep tabs on those peak bloom dates by visiting our special Cherry Blossom page. Don&apos;t forget to share your favorite cherry blossom photos with us on social media using #FXVA and @VisitFairfax.